I didn't realize that they change the tuning so much. I really like the baroque version in this comparison. It feels more musical and accurate IMAO. Thank you for this posting! 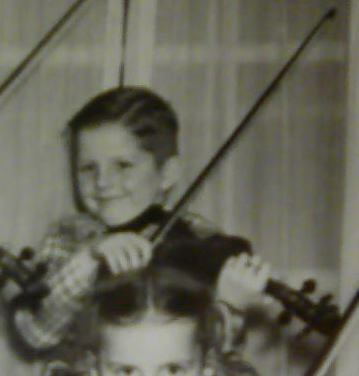 About 35 years ago I was taking violin lessons and had got to baroque music. On my first attempt my violin teacher stopped me cold and said "NO!". I thought I was out of tune. Turns out I was using vibrato. He stressed not to ever use vibrato in baroque music. Last week I watched a YouTube clip of a modern violinist playing baroque using all kinds of vibrato. Has the thinking changed on this? It's still better not to use vibrato when you play baroque but classically trained violinists are stubborn people. Even among great conductors we have the ones that insist that we don't vibrate and those who say it sounds warmer with vibrato. Lot's of times we can't help turning on the color. LOL @Fiddlerman : I'm surprised at your bluntness. With the description in differences between mod. violins and baroque violins and bows, I'm surprised he never touched on the difference in bow hold. The baroque hold is farther up the stick like the lady was holding in the first video. Well, Leopold Mozart, in his writings from around the end of the Baroque period mentions that it should be used tastefully and that there are players who use it constantly and on every note, "as if they had the palsy". But like many stylistic touches it probably came and went in popularity and ideas of how much sounded good most likely varied over the 250 yrs or so of the Baroque period. I mean, two and a half centuries is a long time to expect stylistic fashions in musical technique to have allegedly gone unchanged. I'd bet Baroque performers did use it at least on the longer sustained notes, if they felt it sounded good. Actually he doesn't need to change the equipment or the bow hold. You can play in the Baroque style easily enough if you feel it. I'm just as much to blame for not playing pure Baroque as any of these guys but sometimes I just do it. Usually for myself but when I'm playing wedding gigs and we play Baroque music, I'll ask the rest of the group not to vibrate and they quickly pick up on what I am doing. Truth be told, it takes more effort to sound good when not vibrating. In other words, you need to find more exciting forms of expression. Work much more with dynamics, phrasing and articulation. If I get the nerve, I'll record some Bach (without) vibrato someday. I was at one time considering doing all the Sonata's and Partitas but there are so many violinists who have recorded them. @Ferret Thanks for the videos. It's great stuff to know. Based on the first video, I'm thinking maybe vibrato lets a performer get the attention they want. Look how the Baroque player is fidgeting and shifting around and glancing around and grinning vacantly while the other player is at work. She looks like she's about to start playing while he is. It's very distracting and rude, IMO. If vibrato would prevent that, I would go with the vibrato. I don't see how vibrato would help that. LOL Vibrato as a cure for fidgeting? Besides, she did make some limited and tasteful use of vibrato, if you perhaps missed it. The point of the demo was not vibrato vs non vibrato, but two different sounding instruments, bows and styles. To me it looked more like that little demo was perhaps not well discussed or she had no idea when he might cue her to take over. Or even who was supposed to start first. In which case any rudeness may not have been on her part. Rudeness, to me, was the accompanists getting up and walking offstage while the modern player was playing. It was only a couple minutes, it wouldn't have killed them to stay put and look attentive. Or they should have gotten clear before the recording started. LOL But who knows? Let's try to not read too much into the stage action on what appears to have been an impromptu demo. But it is a fact that some folks are better at waiting for their turn to play than others. Playing is the skill most folks practice. Looking good while standing around onstage and not playing, not so much so. I had discussions on numerous occasions with my section about turning to face the audience and smile while they are applauding. Not everyone 'obeys' so to speak, but most do and it makes such a difference that I received great comments from the audience. I think that this lady was excited and not intentionally rude. My guess is also that she hates when people vibrate intensively and play Bach romantically. This link take you to a good page on the subject. Comparative recordings and lots of info. IMPO:, I didn't detect any rudeness on her part, but like Daniel said, the guys in the background should have stayed put and at one point it sounded like a bowling alley, LOL. Was it the same song they were both playing and if so, was she supposed to continue exactly where he left off ? I think she did a wonderful job. Ken - She played the same thing as he did. Did not take off from where he left off. However, the tuning is different on her baroque violin. @Fiddlerman : Got it. Thanks.